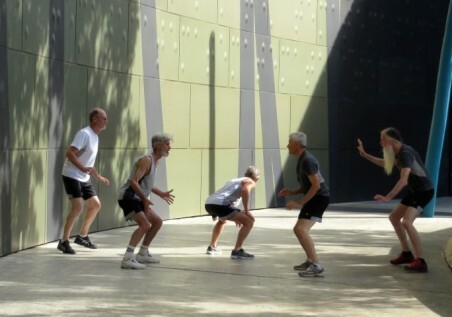 Canberra’s GOLDS (joined briefly on this occasion by two Dance for Parkinsons groups) have once again surprised me. Great Sport! was a site specific production that took place in various parts of the National Museum of Australia, including outdoors in the Garden of Australian Dreams. The production was a celebration of movement and sporting history but, given that the show had its first performance on World Health Day, and given that the program also included a segment by the two Dance for Parkinsons groups, Great Sport! was also a program that focused on healthy living through movement. The production began with ‘Annette’, a celebration of Australian swimmer Annette Kellerman. Choreographed by Liz Lea, joint artistic director of the GOLDS, it was full of glitz and glamour, as was befitting of the subject given that Kellerman was not just a swimmer but an advocate for female issues and a star of Hollywood in the early twentieth century. We saw spangly costumes, 1900/1920s-style cozzies, lots of feathers, fans and froth, and some gorgeous, fun-filled choreography that suited these dancers so well. 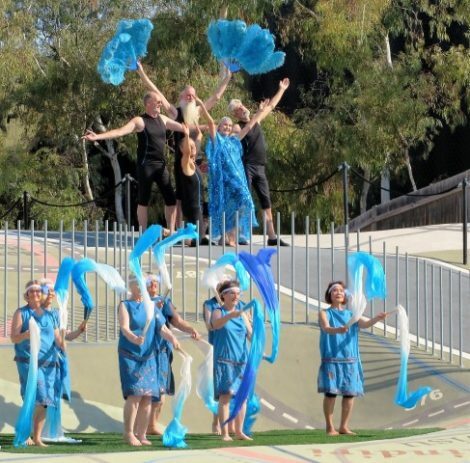 ‘Annette’, which was accompanied in part by an original musical composition/poem by Chrissie Shaw, made wonderful use of the Museum’s surrounding spaces—a pool; swirling, curving pathways; an ancient tree trunk; and soaring architecture. A piece by Gerard van Dyck called ‘First and Last’ also looked good outdoors, especially against a huge, curved metal wall covered in shadows. ‘First and Last’ used the men of the GOLDS and focused on the practising of sporting activities in a non-competitive environment. The theme suited the company beautifully and the men performed with their usual commitment. There is nothing to prove. Just dance! We the audience moved from indoors to outdoors, from outdoors to indoors, taking our lead from Lea as compere for the event. One indoor piece, ‘I used to run marathons’, was particularly moving. Choreographed by Philip Piggin and Jane Ingall (also co-directors of the GOLDS) using people living with Parkinson’s Disease, it was performed to the well-known theme from Chariots of Fire. It took place on a circle of chairs and within the space formed by those chairs, and the circular theme was picked up by the choreography and reflected the Olympic symbol of five connecting rings. While the music had something to do with the feeling of transcendence I got, that each of the dancers had such a different capacity for movement, but that each was completely immersed, was also part of that feeling. Another indoor section, Grand Finale, was choreographed by Martin del Amo. It was gorgeously costumed (based on a concept by del Amo) with the women garbed in long evening dresses, all different. Program notes stated that these women were ‘engaged in a mysterious game, collectively celebrating diverse individuality, on their own terms.’ And it was certainly mysterious as the ten or so women moved amongst each other, forming and reforming various patterns. As seems typical (to me anyway) of del Amo’s work, Grand Finale operates at a level that is somewhat obscure or arcane and, while I often find this aspect of del Amo’s work frustrating, that Grand Finale was meant to be mysterious, or obscure, or arcane, was made absolutely clear by the dancers. They moved through the choreography with distant looks on their faces and with no acknowledgement of each other. But the pièce de resistance was Kate Denborough’s ‘None of us want to be in calm waters all our lives’ (a quote from Jane Austen). It was a spectacular and unexpected end to the program and showed the exceptional theatricality that is at the heart of Denborough’s work. 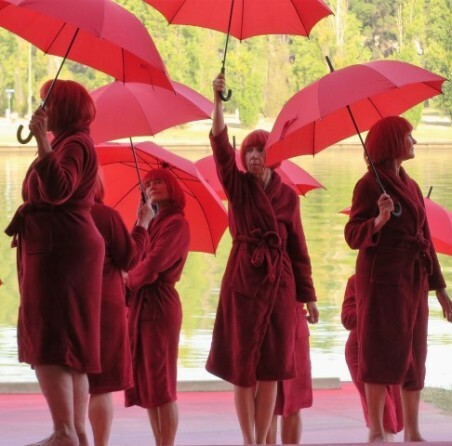 This final piece began with the women of the GOLDS dressed in scarlet dressing gowns and sporting bright red wigs. They began the piece in what initially appeared to be a narrow and quite dark cul-de-sac off the main outdoor area of the Museum. But at the end of this space was a set of double doors and, after performing together for a few moments, the dancers moved towards this door, opened it, and let in a flood of light and a water view (Lake Burley Griffin). They proceeded to open red umbrellas, and then to my surprise undid the dressing gowns to reveal a red swimming costume underneath. They then tripped the light fantastic to the water’s edge, sat down and dabbled their toes in the water, and we watched as a woman with red wig and red gown, paddled a red canoe past them. The play of light and shadow, water and land, and so many other things was breathtakingly beautiful. The canoe became a journey of life. Amazing. Great Sport!, with its beautiful opening ‘Acknowledgement of Country’ choreographed by Tammi Gissell, was a remarkable event and continues the focus of Liz Lea on working in unusual spaces and, in particular, on using the Canberra environment and its cultural institutions as a venue, and as a backdrop to her work. But apart from the bouquets that are due to Lea for her persistent focus on Canberra as a place where dance happens, one of the most interesting aspects of Great Sport! was the way in which the choreographers, all very different in their approaches and choreographic style, were able to maintain and make visible those differences while working with a community group in which movement skills are understandably quite varied. In addition, the GOLDS get better and better in their very individual manner and responded with gusto on this occasion to the work of choreographers with the professionalism to be able to draw out the very best from a community group. The courage and commitment of the GOLDS knows no bounds, and nor does the power and understanding of the choreographers involved. I was blown away by this wonderful event. The NMA’s spaces gave the performances a surreal feeling- so exciting. The final piece in the red tunnel opening onto the Lake was so enthralling, I keep having thrilling visual flashbacks. One of the most moving performance & environment I have ever watched dance in. Many, many thanks for the memories. Thank you for your comment Victoria. Yes, it was a truly exciting event. I thought the audience for the opening show was good, probably 50 or so, but I hear that numbers had grown by the Saturday performance to around 200. Word travels fast when there is something so good on show. Hi Michelle – I thoroughly enjoyed the Great Sport performance I saw on Friday 8th April. I reckon there were close to 250 in the audience. I do think that Canberra is fortunate to have resident Liz Lea – what a jewel of a dance person she is! – and, through her, to attract other choreographers who are inspired by the creative possibilities of older movers and by particular spaces and atmospheres. The involvement of the dancers living with Parkinsons was wonderful also. Every time I see them perform I think that dance art is being re-defined. Overall Great Sport asked about what it is to be human. Big question, well answered through the dance works created. Thanks Lauren. I absolutely agree about Liz and it is true that art attracts art. So let’s hope Canberra goes from strength to strength with dance.